If a Facebook business page gets launched and no one’s around to see it, does it make a sound? Congratulations! You have a Facebook page. Now what? In Part One (Getting Started with Facebook for Business), I walked you through the basic steps to setting up your company’s Facebook page. You’ve filled in the blanks, and you’re ready to go. But how do you get fans and followers? Here are a few ways to start getting your fan numbers up. If you have a personal Facebook account, start by liking the company page and inviting your friends to do the same. To the top right of the screen below your page’s cover photo, there’s a tiny gear icon that gives you the option to Share the page. However, if you’re reading this, you probably didn’t use a personal account to create your page — so it’s going to take a couple of extra steps. 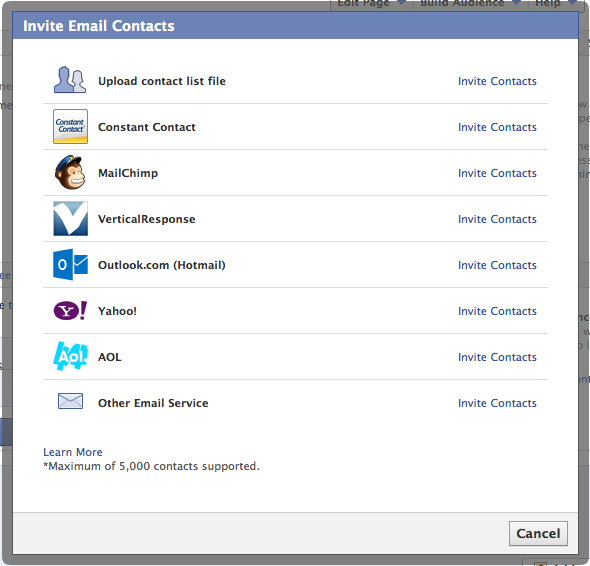 You can either import your contacts from your computer’s address book or attach the contact list you have through a CRM platform like Mailchimp or Constant Contact. 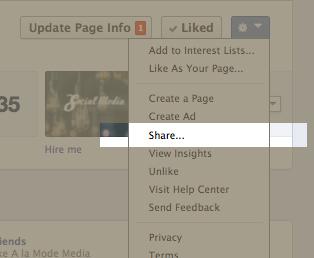 Click on the option you’re using and follow the instructions to invite everybody to support your business via Facebook. Remind them to also tell their friends about your page through their social network. Ask the people who work for you to like your page from their personal accounts, and encourage them to share the page with their friends. Share the link outside of Facebook. Give your Facebook page (and any of your social media profiles) as much exposure as you can by including links to it on your website and email signature. Be sure the links take people to your page with just a click of their mouse (so your new fans won’t have to copy and paste a url). Use the Facebook logo to indicate that you’re using social media – include the logo on marketing materials like postcards or mailers. When you’re at trade shows or industry conferences, tell people to find you on Facebook and have the Facebook logo on signage. Do you or anybody on staff drive a company car or van? Have the logo as part of the decal! It’s not called the World Wide Web for nothing – everything is linked and intertwined, and for your company to successfully connect, you have to reach out and tell people how to find you. Once they know where (and who) you are, it gets easier to grow your following…as long as you keep them engaged.